Jake Paul Net Worth - How Much Money Does Jake Paul Makes On YouTube? Jake Paul is a vine and YouTube personality, actor and entrepreneur. Jake Paul net worth is around $3.8 million. Jake Paul first made in on Vine where he used to post six second videos before venturing on other sites. How did it all start? Well, Paul was a wrestler but decided to quit and focus on film making. He drew inspiration from his brother Logan Paul who had already amassed a huge following from on the platform. Jake Paul is big on other social platforms i.e. 4.5 million followers on Instagram, 5 million fans on Facebook as well as 1.06 million followers on Twitter. Jake starred on Disney show Bizaardvark alongside Madison Hu and Olivia Rodrigo. He has also featured on films ; Mono, Dance Camp, The Monroes and Airplane Mode. He once said it was a great honor joining the Bizaardvark cast. 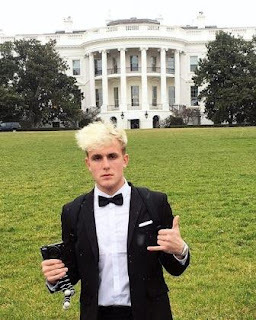 Early this year Jake hid himself in one of the bathrooms in the White House after attending a social media event. He left the White House unnoticed in the morning after several hours, sharing the captured stunt on his YouTube channel. How Much Money Does Jake Paul Makes On YouTube? Jake Paul YouTube channel has 2,433,608 subscribers as of late February 2017. Since launch in September 2013, the channel has gained over 173,281,849 video views. In the last 30 days the channel has gained 39,967,200 views as well as 603,478 new subscribers. We estimate $1.4 million as the annual income from YouTube ads. Jake Paul net worth is boosted by brand and product endorsements. He also manages TeamDom, an influencer marketing management agency that has attracted investors such as Danhua Capital, Adam Zeplain, Horizons Alpha and Vayner Capital.